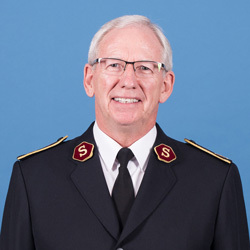 MISSION must be the priority ‘however and wherever we connect with The Salvation Army’, says the international leader of the organisation, General Brian Peddle, in his 2019 New Year message. The message can be watched on the General’s Facebook page and on YouTube and Vimeo. A call is only real when it is acted upon – when we have received it and then responded. As your General, I have made a commitment to listen to the promptings of the Holy Spirit when discerning God’s will and purpose for The Salvation Army in the coming years. And I will affirm my listening and revealed discernment by testing it with others, while also seeking God’s confirmation through personal prayer and the reading of the Word. This call which God has placed on my heart is not only a call to me. It is a call for the whole Salvation Army. It needs to rest with and be responded to by every officer, soldier, adherent and junior soldier; as well as every employee and volunteer. Everything we do should fulfil the sacred mission that God has given his Salvation Army. We know there are countless numbers of people in need of salvation, but even if there is only one more soul in need of it, we still have a duty to do as the Lord God asks us in Deuteronomy – to heed that call, reflect his character and, as his people, walk in obedience. I want to lead an Army that has an invigorated zeal for our part in God’s mission. I need you to take a stand and declare your belief in the whole point of God’s story – the redemption of all creation through a gospel that is for the whosoever. We must believe, as the early-day Salvationists did, that we can win the world for Jesus, and we must spend our lives trying to accomplish that task. The recent years have provided a good legacy – particularly through the Accountability Movement – which still requires full attention. However, with that well in hand, we find ourselves in a position of significant strength and therefore able to consider fully God’s call and realise fully his intended purpose for The Salvation Army. A Call to Prayer: God is calling his people to surrender and prayer. We must engage in spiritual warfare, fought and won on our knees. A Call to Holiness: We must reflect Christlikeness in all aspects of life, recognising that holiness restores our humanity and relationship with God, others and the world. Every Salvationist should be a living example of biblical authenticity. A Call to be Battle-ready – now! We must understand the urgency of ‘now’. Our world needs Christ today, not when we have finished working on our plans! Despite all that needs to be done within our movement, we continue to fight the battle while we grow, strengthen our resolve and prepare for greater battles. A Call to Serve: Serving others must be our missional priority. We must value officership, local officership, soldiership, adherency and junior soldiership, recognising too that The Salvation Army’s many employees and volunteers are key to fulfilling our tasks. A Call to Worship: We should celebrate God’s redeeming love through our worship, seeking culturally-relevant ways to join together in praise and thanks as we reach out to and welcome others. A Call to Confidence in the Gospel: As we share the good news of the gospel, we must recognise its power for salvation and transformation. Through the power of the Holy Spirit, people can be released from everything that stops them reaching their God-given potential. A Call to Raise and Nurture Every Generation: We must accept responsibility for children, young adults and emerging leaders – equipping, growing, empowering and discipling our present and future Salvation Army. A Call to Costly Compassion: We must defend others, seek justice, express generosity and participate in redemptive actions. A Call to Inclusion: We must be beyond reproach in treating all people with respect and compassion, remembering our mission to meet human needs in Christ’s name without any discrimination. We are not alone in this battle. We stand on the shoulders of those ‘giants’ who have gone before us. Through their legacy we have proof of God’s faithfulness and the ability to see further. And of course, God himself goes before us! We serve under our Blood and Fire banner of transformation, believing that as an international family we are stronger together, and that each of us can be a transformative influence right where God has placed us. Let us march into these next years with confidence, knowing that if we apply the values of the Kingdom we will forge a path to victory. Join me in this fight to be The Salvation Army that God called us to be. Help me position the Army so that it is right at the heart of God’s will, ensuring his continued blessing and hand of protection as we strive to meet the challenges of the 21st century. And as we participate in the cause of Christ in almost two-thirds of the world’s countries, we give all the honour and glory to God. Amen! General Brian Peddle expands on his Call to Mission in a series of three sermons.